DIE VILLA HAT KEIN WIFI. Der Bungalow in Moraira verfügt über 3 Schlafzimmer und hat eine Kapazität für 5 Person(en). Die bequeme und in Randlage gelegene Unterkunft verfügt über 80 m² und verfügt über eine tolle Aussicht auf den Garten. Die Unterkunft befindet sich 150 m vom Sandstrand "Moraira" entfernt, 150 m vom Kiesstrand "Moraira", 300 m von der Stadt "Moraira", 500 m vom Supermarkt "Moraira", 3 km vom Golfplatz "Club de Golf Ifach, Calle Micheta, 5, Ctra Moraira a Calpe, Km, 3. Urb. San Jaime, 03720 Benissa", 92 km vom Flughafen "Aeropuerto Alicante-Altet, 03195, Alicante", in einer idealen Umgebung für Familien und am Meer. Die Unterkunft verfügt über einen Garten, Gartenmöbel, Terrasse 30 m², einen Grillplatz, ein Balkon, eine elektrische Heizung, einen Ventilatoren, 1 Fernseher, Satelliten-TV (in den folgenden Sprache(n): Spanisch, Englisch, Deutsch, Holländisch, Französisch), einen DVD-Player. Old, dark, miserable. After collecting the keys we drove to the villa but couldn’t stay there as it was awful. Everything was falling to bits on the patio and it was so dark inside with no ceiling fans in the bedrooms. If you lifted to dark brown, sticky, mosquito blinds in the bedrooms just so you could have some light the bushes outside were full of insects that would get in to your room at night! Goodness knows where the sea was! You would have had to cross the main road to get to it. Moraira ist ein ruhiges Städtchen an der Costa Blanca in Spanien , ganz in der Nähe von Calpe und ca. 75 km vom Flughafen in Alicante und 110 km von Valencia entfernt . Moraira liegt direkt an der Küste und verfügt über 2 wunderschöne Sandstrände (L’Ampolla und Playa del Portet), sowie 8 km Steilküste und Buchten. The small coastal town of Moraira is part of Teulada municipality and is known for its tranquility and its beautiful, large, traditional fishing and sports harbour. As time went by, the local people started to settle down near their working places and started dedicating themselves more and more to fishing. This was the beginning of the town nowadays known as Moraira. With a year average of 18 degrees Celsius temperature and 320 sunny days, Moraira is an excellent all year holiday destination at the Costa Blanca. Along the coastline of Moraira you will find beautiful, fine sandy beaches with crystal-clear seawater, like L’Ampolla, Les Platgetes (half sand and half rocks) or Playa del Portet. Beside those there are also small bays like L’Andrago, Punta Estrella, Cap Blanc and La Cala. L´Ampollo is the most familiar beach. Apart from the beautiful rocky and sandy beaches Moraira also has interesting sights like Castillo de Moraira. This fortress stands on a rocky hill at L´Ampolla beach, you can’t miss it. It was built in the 18th century for the protection against attacks by Berber pirates. The unusual shape of the building is commonly known as pezuña de buey (ox hoof) because of the semicircular southern outside wall and the straight northern outside wall. Or visit the Parish Church of the “Mare de Déu dels Desemparats”. This church was built between 1875 and 1878 and is situated in the centre of Moraira. The church has a rectangular shape and a quite plain and simple interior, except for the portrait of “Virgin de los Desamparados” and two beautiful mosaics. The Torre de Vigilancia del Cap d´Or stands at the highest point of the Cap d´Or, on the edge of the rocky coastline. The tower is solid and does not have a doorway, to ascend the tower, a rope ladder was let down from above. There were also two cannons situated on the tower. All for the defending the port of Moraira against attacks of Berber pirates. There are several amusement parks not far from Moraira, like Terra Mítica, the first real theme park in Spanien. This amusement park is divided into five areas, five lost civilisations of the Medieval en the main rides take you back to the myths and legends of these ancient cultures. Aqualandia on the other hand is a huge water park where children of all ages can spend an incredible day in many swimming pools with springboards, rapids, waterfalls and slides. To visit beautiful exotic en marine animals and several shows and other attractions you can visit Safari Park Vergel or animal park Mundomar. 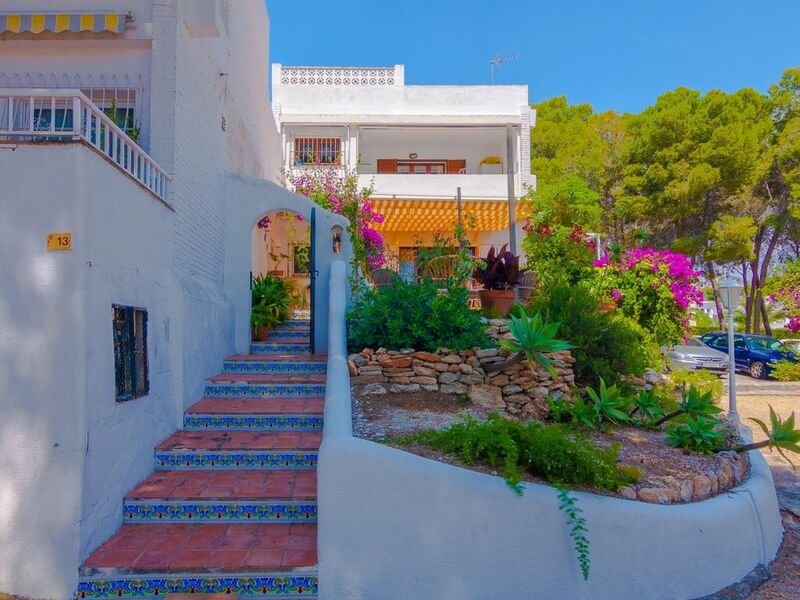 The luxury holiday homes, villas and apartments are situated in several urbanisations of Moraira, against the forested hills, not far from the sea. Moraira has a large variety of restaurants and bars both in the village as well as on the beach where you can a fine variety of dishes. For the sports-loving tourists are there in Moraira and her surroundings many facilities. You can dive at one of the many diving centres, play tennis, go horse riding, drive a go-kart, go squashing or play golf.